Calcite is a calcium carbonate mineral. Calcites are among the most varied and abundant crystals, and they occur in a wide variety of forms and colours. The molecular structure of the crystals is rhombohedral, but specimens can appear as as scalenohedrons, rhombohedrons, prisms, masses, stalactites, etc. Calcite makes up the major part of most marbles and limestones. Calcite crystals are found on every continent. Large deposits of brightly coloured Calcites occur in Mexico, and some of the most desired forms, such as Stellar Beam Calcites, are found in the USA. 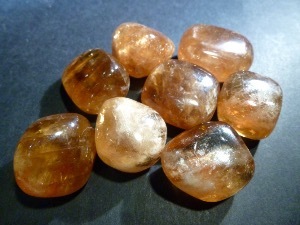 Honey Calcite tumbled to a smooth finish, an ideal pocket size stone, small enough to carry around with you. Tumble Stones can also be placed around the home for their energies or can just be nice decorative items. 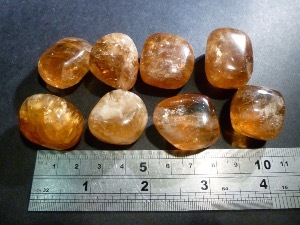 Honey Calcite crystal gemstones of varying sizes selected specially for your order.